Patrick Anthony is excited. As the new data analytics manager at Overstock.com, he’s responsible for building machine learning and deep learning solutions to further the company’s marketing capabilities. He is also hiring and training a team of advanced analytics professionals who can contribute to this effort. To make the most of his role, he has applied all the data science knowledge he gained from several years of consulting and a master’s degree in Data Science from the University of Wisconsin. It all started as a hobby really. Early on, Patrick was interested in games—from puzzle games to action-adventure video games to sports. That initial interest evolved into more complex pursuits in college. As an undergraduate student, he filled his schedule with upper-level math, statistics and probability, and computer programming courses. He took a specific interest in game theory, agent-based modeling, and evolutionary economics. He wanted to move beyond the traditional paradigm of classical economics and contribute to the evolutionary perspective of choice, systems, and organizations. After graduating with his bachelor’s degree, he became a data analytics consultant for Seattle-based companies such as Microsoft, Amazon, and Tableau Software. He was quickly hooked. “Solving quantitative problems in that fast-paced consulting world energized me,” Patrick says. Eventually, he decided to leave consulting to take a full-time position with Tableau, a data visualization company. He helped develop data science strategy and solutions to improve the impact of marketing, sales, and customer success programs. 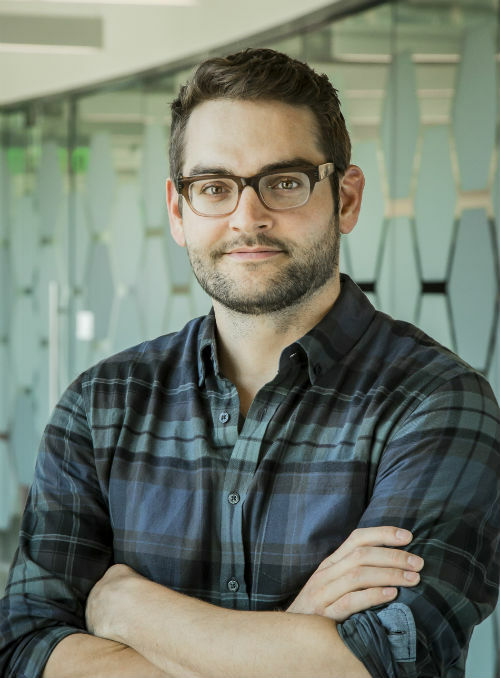 “I used machine learning and prescriptive analytics to identify value for the business.” This high-impact work earned him official recognition by Tableau and a company award honoring his efforts. Patrick graduated from the UW Data Science program in 2017. He says the rigorous curriculum grounded in computer science, math and statistics, management, and communication prepared him to become a full-fledged data scientist and leader. Since he started at Overstock.com in March 2018, Patrick has used his knowledge of statistics, machine learning, artificial intelligence, data mining, and natural language processing daily. In particular, the program helped teach him to distill vast stores of complex, unstructured data into actionable insights and improved decision-making. These skills are critical for a data scientist at Overstock.com—and are sure to help him continue to lead and innovate in the future. Start exploring the UW Data Science program. Have questions about the courses, tuition, or how to apply? Talk with an enrollment adviser by emailing learn@uwex.edu or calling 1-877-895-3276. We often receive this question from prospective students. So, we created this post to give you an inside look at the first data science course in the curriculum, “DS 700: Foundations of Data Science”—and to answer some of the questions that may be on your mind. What do I learn in the course? “DS 700: Foundations of Data Science” introduces you to data science and its importance in business decision-making. The course provides an overview of commonly used data science tools, such as R, Tableau, and SQL Server, along with assignments on descriptive and predictive analytics. There is a focus on statistics, programming, ethical perspectives, and strategic deployment of analytics to lay the foundation for data science applications. This course has 14 lessons that consist of lectures, readings and other media, assignments, discussion prompts, quizzes, and a final project. Define data science and discuss its role in decision making. 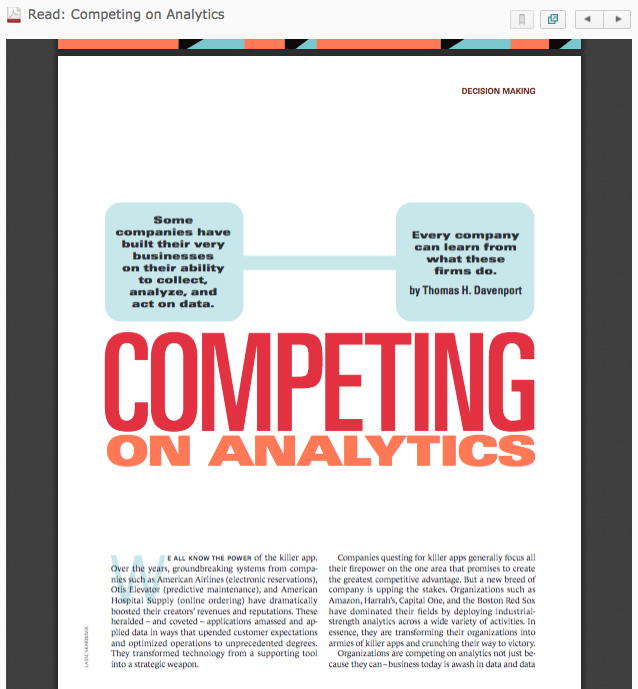 Understand how companies can use analytics to compete and succeed. Be aware of ethical issues in data analytics. Solve basic analytical problems via data analysis using techniques like forecasting, visualization, text mining, data cleaning, missing value imputation, using programs like Excel, R, and Tableau. Communicate your perspective on opportunities and challenges related to data science. What are the lectures like? After you enroll in “Foundations of Data Science,” you can log in to the learning management system to access all course content. The lectures are hosted in Storybook+ media player and contain rich media content—slides, animations, videos, and instructor narration. You can listen and replay lectures as many times as you wish. Some lessons have video content featuring interviews with real-life data scientists about their work and the current industry landscape. Other videos show the professor demonstrating vital skills that data scientists use on the job, including how to perform a K-means cluster analysis or work in SQL server. What type of assignments do I complete? Assignments are a series of exercises—usually three—that encourage you to practice and demonstrate the concepts you learned in that lesson. You might be asked to develop a forecasting model or perform visual analytics in Tableau and R.
What else do I do in the course? Learning material. The professor for this course picks selections from textbooks, articles, or videos for students to watch. Sometimes, you are asked to reflect on this material in an assignment or discussion prompt. Discussion posts. A lesson may include a graded discussion prompt, which gives you an opportunity to learn from your peers and contribute your own ideas to the group. For these, you craft an initial post and reply to other students’ posts. Quizzes. Most lessons include a timed quiz of 25 to 30 questions covering that week’s course content, readings, and videos. What technology do I use in this data science course? You use SQL Server 2014, R Studio, Tableau, and Microsoft Office (Access, Excel, Word, PowerPoint). All of these software applications are on the virtual desktop platform, which you have access to as a student in the UW Data Science program. Dr. Rajeev Bukralia, a former instructor at UW-Green Bay, originally developed the content for “DS 700: Foundations of Data Science.” The course was revised by instructor Dr. Gaurav Bansal and Dr. Shoo Il Shin from UW-Green Bay in fall 2017. Faculty work with an instructional design team and industry advisory board to ensure that the course remains cutting-edge and aligned with employer needs. Do students in the course interact? Yes. Students interact and share ideas through graded discussions in the learning management system. Also, data science students can collaborate, ask questions, and have general, non-assessed discussions through Piazza, a web-based forum. Click to zoom in on the conversations. How much do I do in one week? This data science master’s curriculum is as intensive as any University of Wisconsin program—on campus or otherwise. Some students put 20 hours of work into one course each week. But that number varies widely depending on how much experience they bring to the program. Although the program requires a serious time commitment, the flexible, online format allows you to study early in the morning, late at night, or whenever works best for your schedule, making it ideal for those who work full time. Have questions about “DS 700: Foundations of Data Science,” the rest of the curriculum, how to apply, home campuses, and more? Our enrollment advisers can help. Call 1-877-895-3276 or email learn@uwex.edu. Your smart summer checklist should include plenty of SPF and water. But here’s another item to add to your list: An online University of Wisconsin Data Science master’s degree. And by taking advantage of summer semesters, you can cut six months off of your total time to your degree. In this program, you must complete 36 credits to graduate—summer is a valuable time to blast through more credits and start benefiting from your master’s degree sooner! Please see the UW Data Science Course Schedule page for information about specific courses. If you are not already enrolled, your first step will be applying to the UW Master of Science in Data Science. Click here to learn more about the application process. If you have questions, please contact a UW enrollment adviser at 1-877-895-3276 or learn@uwex.edu. They can walk you through the process. 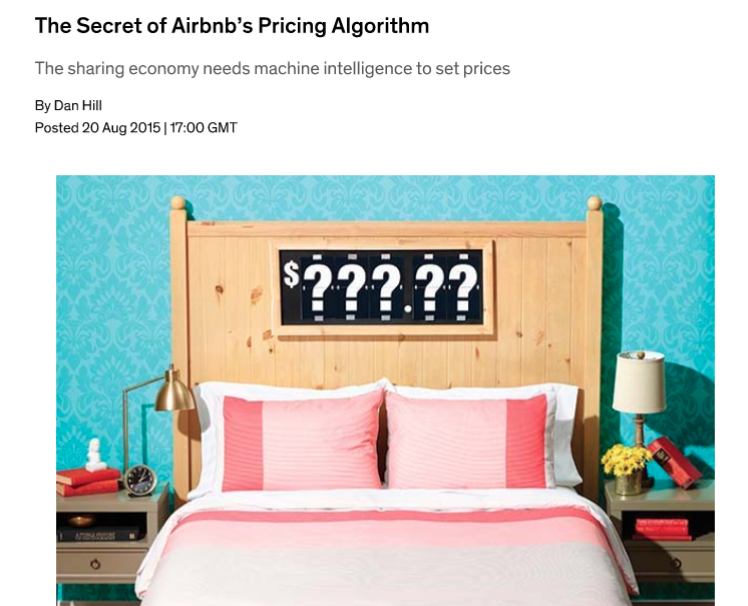 If you’re a data scientist, you probably recognize the names DJ Patil and Jeff Hammerbacher. Not only are both often credited with popularizing the term “data science,” but they also exemplify the modern data scientist—that is, one who applies his or her data-savvy expertise in any setting that demands it, including healthcare, e-commerce, social media, and journalism—just to name a few. When it comes to landing the data science job of your dreams, you only get one opportunity to make a first impression. You need to make it count. How can you do that? 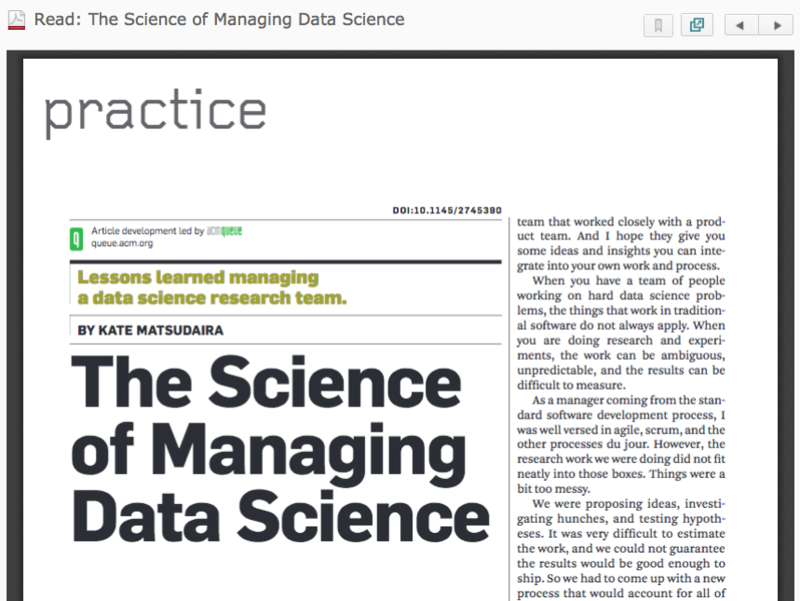 It’s simple: A succinct and targeted data science resume and cover letter. When written effectively, both documents set you apart from other candidates and convey exactly what you can offer and why. Polish your data science resume and cover letter using these tips so you stand out from your competitors. You know to include your full name, credentials, address, phone number, and email address. If you have a professional presence on LinkedIn, Twitter, GitHub, or another social media site, consider providing links to those as well. Make it as easy as possible for hiring managers to get in touch with you. The professional summary should tell your story—where you’ve been and where you’re headed next. Think of it as your elevator speech—that is, the way in which you’d describe yourself and your abilities in 30 seconds or less. You’ll likely have different versions of this speech depending on the type of data science position for which you’re applying as well as the industry. This is your chance to grab a hiring manager’s attention and encourage him or her to keep reading, so make it worthwhile. This section should include a bullet-point list of your data science strengths (e.g., statistical analysis, data interpretation, and communication) and explain generals tasks you’ve completed to achieve each competency. For example, with data communication, perhaps you could include these tasks: Write, format, and present technical prose; facilitate data-informed discussions; and help non-technical professionals act on data findings. Refer to data science course outlines to help build this portion of your resume. That’s because most data science course descriptions also include core competencies and learning objectives that you can use as a foundation. List each degree and institution as well as the date of graduation. A Master of Science in Data Science proves to employers that you have the wide range of knowledge and skills needed to do any data science job. Consider listing any courses that are particularly relevant to the job for which you’re applying. For example, if you’re hoping to land a data scientist job in biomedical research, consider listing any data science ethics courses in which you applied various analyses using an ethical framework. Tie your education experience as much as possible to the job you seek. This section should include a bullet-point list of specific data science skills you’ve honed as well as tools with which you’ve worked. If you earned a data science master’s degree, list that you have hands-on experience with data science tools such as SQL Server and Tableau and languages such as R and Python. Don’t list tools for which you only have a theoretical knowledge. Hiring managers want to know that you have experience working with these tools and will likely ask you for examples during an in-person interview. Don’t worry about keeping your resume to one page—that’s an outdated notion. If you’re a mid-level or above professional, you’ll likely need two pages to list all work experience. And never skip significant job experiences, even if they’re unrelated to the job to which you are applying. A gap of time between jobs is a red flag to hiring managers. For unrelated job experiences, don’t include as much detail on your resume as you would for other jobs. Tailor each job description to the one you’re applying for. For example, if the position you hope to land requires an in-depth knowledge of SQL, tailor your previous job descriptions to highlight your use of SQL. Also focus on key accomplishments in each previous position by listing a select group of three to five projects and briefly describing your role in each project’s success. Use action words (e.g., created, managed, coordinated, or led) to describe your participation. A strong data science resume also incorporates the keywords for which hiring managers are searching. This will vary from job to job, and a good rule of thumb is to incorporate as many of the same terms and phrases used in the job posting directly into your resume. You’ll also want to incorporate as many general data science keywords as possible. For example, Data Science Central lists these top 27 data science keywords that you could reference if it makes sense to do so. Don’t force yourself to include these terms. Use this list as a point of reference, and be cognizant of it as you construct your skills, competencies, and previous job descriptions. Personalize your love for data science and why you want to work in this field. Tell a brief story about why you love data and what you hope to accomplish in the data science role that you seek. Explain why you want to work for that specific company. Look at the company’s “about us” page, and respond directly to the values the company promotes and why these values are important to you as well. Expand on projects listed in your resume. What skills did you hone, and what did you learn that you can apply going forward in a future data science position? Remember the unrelated job experiences discussed above? The cover letter is your chance to highlight those experiences and explain how skills you gained in a different field will transfer to this job. This is what will make you truly stand out as a candidate. Keep the layout simple. Use a straightforward layout and font for your resume and cover letter. Let the content do the talking. And never go below an 11.5 font size. Proofread for grammar and punctuation. Data science is all about the details, and you don’t want to ruin your chances of landing an interview by misspelling a word or forgetting a crucial punctuation mark. Invite feedback from a friend or colleague. Are there areas for improvement? Is the resume clear and succinct? Don’t hesitate to look at other data science professionals’ resumes as well. This includes LinkedIn profiles—especially those profiles of individuals who already work for the company to which you’re applying. What language do they use, and what skills do they promote? Use this as a guide for developing your own stellar and unique resume and cover letter. Considering a Master of Science in Data Science? University of Wisconsin offers this degree online through six campuses. Learn more about the program and which UW campuses offer the degree here. A quick search on LinkedIn reveals more than 8,000 data scientist jobs nationwide. More than 5,000 of these jobs were posted in the last month. More than 300 were posted in the last 24 hours alone, suggesting that those who pursue a data science degree can literally (and figuratively) bank on job security. Data scientists work in virtually every industry, including healthcare, computer science, information technology, retail, marketing, manufacturing, transportation, communication, education, insurance, finance, science, security, government, nonprofit, and law enforcement just to name a few. Companies such as Facebook, Amazon, IBM, Kayak, Capital One, The New York Times, and others continue to clamor for those with data science training who can drive business intelligence using voluminous and complex data. Use big data tools (e.g., Hadoop, Spark, H2O, and AWS) to conduct the analysis of billions of customer transaction records. Establish scalable, efficient, and automated processes for large-scale data analyses that will tie into production systems. Use predictive analytics and machine learning to create new products or drive business decisions. Apply expertise in quantitative analysis, data mining, and the presentation of data to see beyond the numbers and understand how our users interact with both our consumer and business products. Interpret, document, and present/communicate analytical results to multiple business disciplines, providing conclusions and recommendations based on customer-centric data. Employers want to hire data scientists who don’t just know the technology but who know what to do with it; agile communicators who are well-rounded can remain flexible as new challenges and business needs arise. If you’ve thought about pursuing a career in data science, look for a program that provides not only a solid foundation rooted in statistics and computer programming but also one with instruction in economics, business management and communication. Create and manage simple databases in Access and SQL Server. 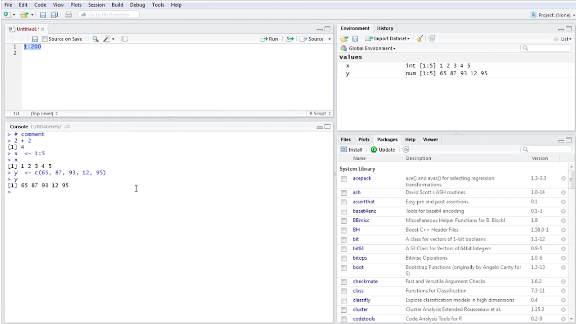 Write and execute SQL statements to retrieve and manage data. Analyze data to solve basic analytics problems using Excel and R.
You’ll learn all of this and more, including how to use other well-known data science tools (e.g., PowerBI and Access) in the course, Foundations of Data Science. Use Python and R to analyze real-world data. Use an application programming interface (API) to collect real-world data from social media. Clean and format data for analysis. You’ll learn all of this and more in the course, Programming for Data Science. 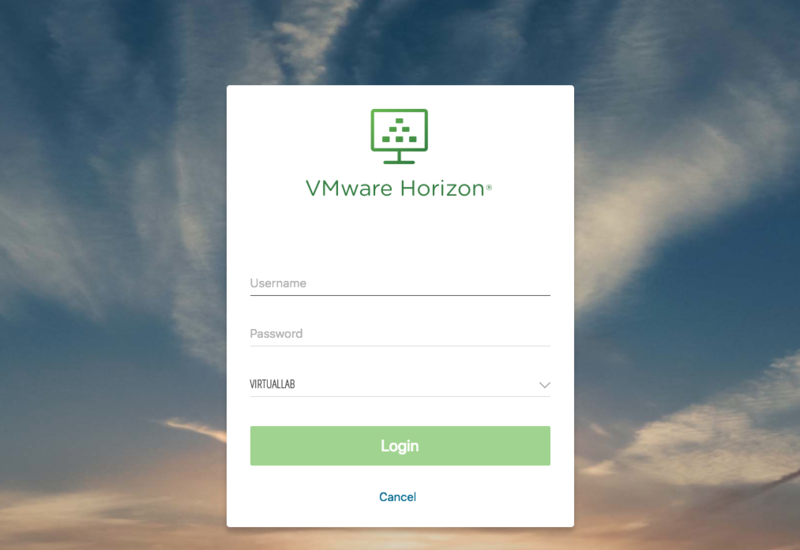 Use tools and software such as Hadoop, Pig, Hive, and Python to compare large data-processing tasks using cloud-computing services. You’ll learn this and more about big data analysis in the course, Big Data: High-Performance Computing. Help non-technical professionals visualize, explore, and act on data science findings. You’ll master technical, informational, and persuasive communication in the course, Communicating about Data. Create effective visuals to maximize readability, comprehension, and understanding of complex datasets. You’ll learn this and more in the course, Visualization and Unstructured Data Analysis. Use data and predictive analytics to inform the decision-making process. You’ll learn this and more, including optimization, decision analysis, game theory, and simulation in the course, Prescriptive Analytics. Transform findings from data resources into actionable business strategies. Explain how data assets can be used to develop competitive advantage. You’ll learn this and more about how to obtain decision-making value from an organization’s data assets in the course, Data Science and Strategic Decision Making. In addition, the University of Wisconsin partners with an industry advisory board dedicated to helping students bridge the gap between classroom learning and real-life data science challenges. Their continual input helps ensure course content meets today’s employer needs in this rapidly evolving field. This makes for a smooth transition into the workforce. 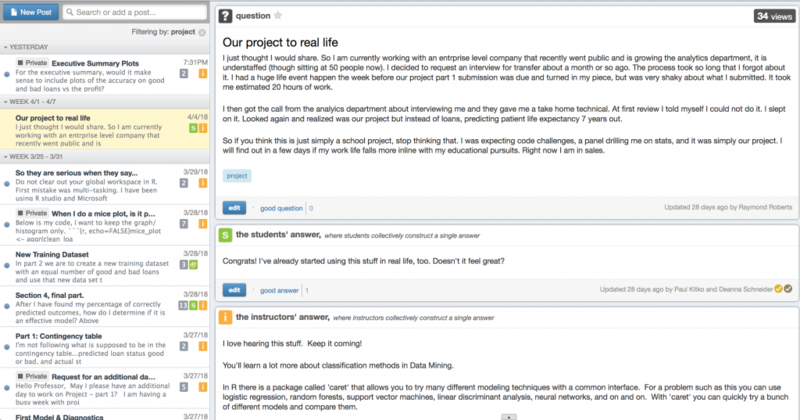 Identify organizational questions for which data science can provide answers. Collect and manage data to devise solutions. 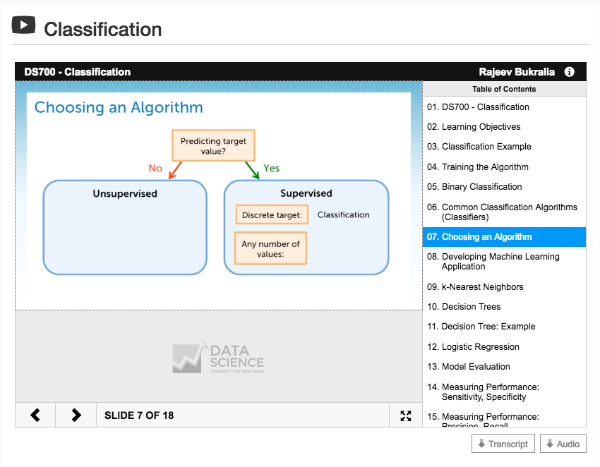 Select, apply, and evaluate models to solve data science tasks. Interpret data science analysis outcomes. Effectively communicate data science-related information in various formats and for various audiences. Value and safeguard the ethical use of data. Increase your value to employers seeking savvy, well-rounded data scientists by earning a University of Wisconsin master’s degree in data science. To learn more, download a program guide at https://datasciencedegree.wisconsin.edu/.